Swallowtails are butterflies in the subfamily Papilioninae within the family Papilionidae. Most of the swallowtails in Kentucky are large and easy to recognize, with bold black-and-yellow or black-and-blue patterns. Unlike butterflies in many other families (including Nymphalidae and Daniadae), swallowtails do not have tiny front legs. Swallowtail caterpillars vary in color and shape, depending on the species, but most have smooth skin, and some have long, tentactle-like projections. Swallowtail caterpillars are able to extend a brightly-colored, Y-shaped horn (called an "osmeterium") from behind their heads when they are disturbed. These horns are able to secrete foul-smelling defensive chemicals. Pictured below is the caterpillar of the Pipevine Swallowtail, Battus philenor. SIZE: Adult wingspan up to 5 1/2", caterpillar up to 3"
As with all butterflies, swallowtails have complete metamorphosis with egg, larval, pupal, and adult stages. Adults and caterpillars are active in warm months. Most species overwinter as pupae. Many swallowtail adults and caterpillars are common in feilds, meadows, and other weedy areas. Others are common in wooded areas. Swallowtail caterpillars feed on a variety of wildflowers and plants, depending on the species. The adult butterflies feed only on nectar. Swallowtail caterpillars use a variety of defenses to protect themselves from predators. As mentioned above, swallowtail caterpillars are able to secrete chemicals from their osemetaria. These chemicals smell and taste bad, and deter most predators. In addition, some swallowtail caterpillars, such as the spicebush swallowtail, resemble snake heads. It is believed that this resemblance will frighten away birds and other large predators. Also, like most caterpillars, swallowtail caterpillars will sometimes "let go" of their perch and fall to the ground when they are disturbed. Even though they have lots of defenses, swallowtail caterpillars are attacked by a wide variety of predators, including birds, spiders, and other insects. 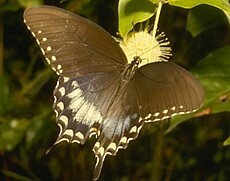 Adult swallowtails are preyed upon by birds and flying insect predators, such as dragonflies and robber flies. Swallowtails are not normally considered pests, although a few species feed on the foliage of garden plants. Pictured below right is the Spicebush Swallowtail, Papilio troilus. It is one of the most common woodland butterflies seen in Kentucky. 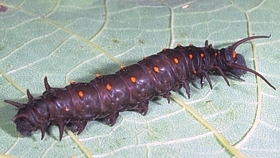 The caterpillar (below left) feeds on spicebush, sassafras, and other low-growing forest plants. As mentioned above, the caterpillar of the Spicebush Swallowtail resembles the head of a snake. Its osmeterium even looks like a red, forked tongue, helping to complete the illusion. Shown below right is the Black Swallowtail, Papilio polyxenes, another common Kentucky swallowtail. This butterfly is often found in open fields. The Black Swallowtail is one of the few pest butterflies: its caterpillar (below left) sometimes feeds on parsley, carrots, and related garden plants. It also feeds on the wild relatives of these plants. One of our most recognizeable swallowtails is the Eastern Tiger Swallowtail, Papilio glaucus. This butterfly is very common, and at certain times of the year Eastern Tiger Swallowtails can be seen by the hundreds in eastern Kentucky forests. The Eastern Tiger Swallowtail is shown below left. 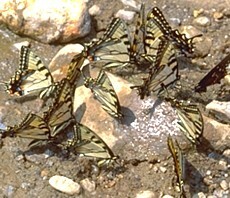 Below right, several tiger swallowtails have gathered at a puddle. This is a common site: butterflies of many species often visit muddy water to gather moisture and nutrients, a behavior called "puddling." The caterpillar of the Eastern Tiger Swallowtail is very similar to the Spicebush Swallowtail caterpillar, with a snake-like appearance. It feeds on the leaves of certain hardwood trees, such as tulip trees, ash, birch, and cherry. You can see a picture of it here on the Caterpillars of Eastern Forests website. Shown below is the Zebra Swallowtail, Graphium marcellus. 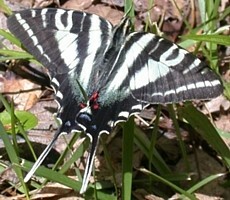 Like the Eastern tiger Swallowtail, tthe Zebra is common in wooded areas. The Zebra Swallowtail caterpillar feeds on pawpaw leaves, and resembles the Black Swallowtail caterpillar, but with many narrow yellow and green rings. It is pictured here on the Caterpillars of Eastern Forests website. Swallowtails are common butterflies, and are found in a variety of habitats. Eastern Tiger Swallowtails and Spicebush Swallowtails can almost always be found in Kentucky forests during the spring and summer, while many other swallowtails are common in meadows, on farmland, and near the forest edge. 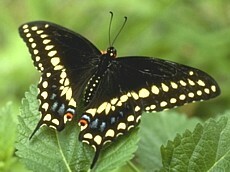 Swallowtails usually have a slow, lazy flight compared to other butterflies, and are easy to catch with a butterfly net. Swallowtails are popular photography subjects, but getting a good picture can be a challenge - even when a swallowtail isn't flying, it is usually walking or moving its wings up and down. As with all insects, if you find a swallowtail on a cool summer morning, it will be moving slowly and will make a much better photo subject. Swallowtail caterpillars are slow moving and easy to capture, and can be found on a variety of plants, depending on the species. All insect larvae should be preserved in alcohol. You can also raise a swallowtail caterpillar, but remember that it will be very picky: be sure to identify it correctly and give it the right kind of food. Also, since most swallowtails spend the winter as pupae, if a swallowtail caterpillar that you raise turns in to a pupae, it is important to keep it outside, or in another cool location, for the winter. Swallowtails were sometimes used to represent the images of certain Mexican mythical figures. Read more about these images in Butterfly Images in Mexican Myth and Textiles at the North American Butterfly Association website.